An original special effects head used in the production of The Crow, the 1994 picture starring Brandon Lee. This is the original special effects Top Dollar head used as a stand in for actor Michael Wincott in the climatic scenes where Top Dollar meets his demise at the hands of Eric Draven (Brandon Lee). Created by special effects make-up artist Lance Anderson the head is constructed from soft foam with a silicone skin which has been meticulously hand painted to an extremely realistic finish, the hair is genuine and hand punched. 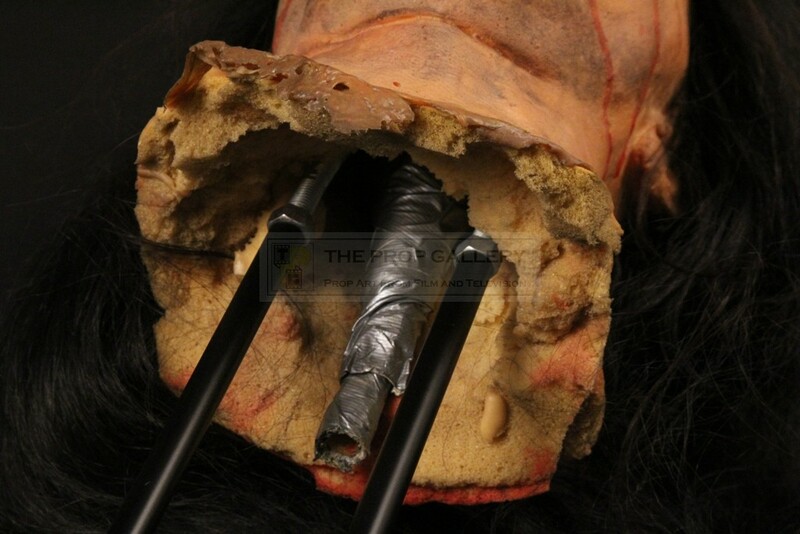 The head features the spike of the statue which impales him protruding from the mouth and to the interior of the head is a tube used to pump blood to the mouth area where much of the studio blood remains from use during the production. The head is presented on a display stand featuring the movie logo which can be lit by pressing a switch to the rear, this stands approximately 30" high with the dimensions of the base being 8.5" x 7". Top Dollar remains in near perfect original condition with minimal wear from use during the production. This represents an instantly recognisable and a highly displayable special effects artefact from this cult picture will be forever remembered for the tragic accident which killed Brandon Lee on set aged just 28.